firmware update Galaxy Note 2 Lollipop Rumours samsung Confirmation that the Note 2 will get the Lollipop update? Confirmation that the Note 2 will get the Lollipop update? Well, this made me double check my database for firmware updates... We had always thought that the Note 2 should get the 5.0 update, but it looks like it might be confirmed. 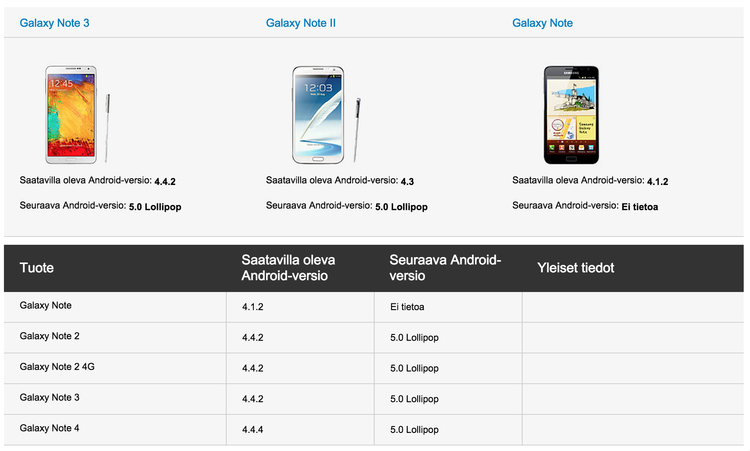 The Finnish side of Samsung's website on their site that it looks like the Note 2 will be getting the update to 5.0 (along with the Note 3, but the Note 1 is 'el tietoa' - no information). As with most of these tidbits of information, what we don't know is the time table. The update of the 4 and 3 to 5.0 should be fairly easy, as we've seen in some leaks already. For the 2 to go up, it may have to be updated to the newer style of TouchWiz (in my opinion), which could mean a longer development period. I still know lots of folks with a Note 2 (my son included) and running the device on Lollipop should really help breathe new life into it. Let's hope it's sooner, rather than later.